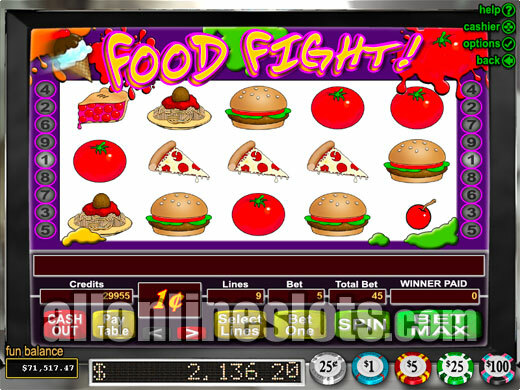 Food Fight is a 5 reel, 9 line slot from Realtime Gaming. It has a 45 coin maximum bet and a top jackpot of either 6,250 coins or a progressive depending on where you play. You also have two bonus games with the Ice Cream and Food Fight features. Food Fight is an older style 5 reel, 9 line slot machine from Realtime Gaming. It can be configured by the casinos to be either a stand alone progressive or a fixed jackpot game. In addition to the wins possible on the reels the game has two bonus features where you always win extra coins. The game comes in several coin sizes starting at one cent. From what we have seen the casinos tend to make the lower limit games progressive while the higher $1 and $5 limits are fixed jackpots. Maximum bet on Food Fight is 5 coins per line or 45 coins total per spin. 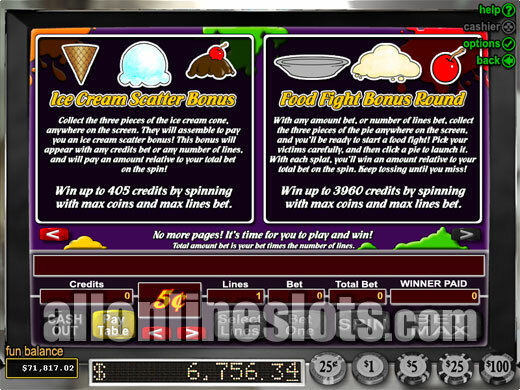 The top jackpot on Food Fight is won by lining up five ice cream bowls with max bet in play. This either wins 6,250 coins or the progressive. On the progressive variations you must play five coins per line to have a shot at winning the progressive. If you play less than max coins you win between 1,000 and 4,000 coins for the five ice cream bowls. Second highest pay is for five of the spaghetti and meatballs symbols which award 3,500 coins at max bet. Third highest line win is 1,250 coins for five cherry pies. In total there are 21 winning combinations with several of the wins starting at just two aligned symbols. Food Fight has two bonus features. The first feature is the Ice Cream Scatter Bonus. You win this by getting a scattered cone, ice cream and chocolate cherry. Once won the three scatters align and award a multiplier of the triggering bet. You can win up to 405 coins with this bonus. The second bonus is the Food Fight Bonus Round and pays up to a big 3,960 coins To win this bonus you need to get a scattered bowl, ice cream and cherry on reels 1, 3 and 5. YOu then move to the second screen stage where you get to pick targets to reveal your prizes. (Screenshot). You get to keep picking targets until you miss..
Food Fight does look a little dated when compared to other slots in the 9 line category. 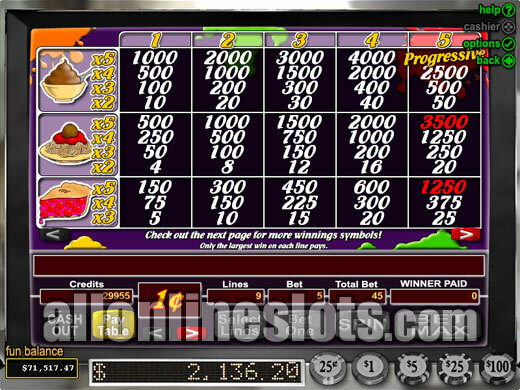 It does however have two bonuses and some nice jackpots so if you are a nine line slot fan it is worth a look.